I have a friend who believes cheesecake is a side dish. During a recent Sunday brunch, I dipped a blueberry in a yogurt sauce and attempted to feed it to my husband. You would have thought that I was poisoning him. For some people, fruits and vegetables are hard. I may whip spinach into my mashed potatoes and blend it into meatballs. I will roast broccoli, cauliflower and sweet potatoes. I make a chiffonade of Brussels sprouts. Winter squash is baked, zucchini is grilled and green beans are sautéed. However, the chance of my husband requesting one of those is slim. So when I baked a Cracker with Greens and my husband sampled it, came back for more and asked that I make it again, I counted my lucky stars. I won’t pretend that a little kale pressed into the top of a flaky, buttery crust is the epitome of health. But it is a little bit of a green vegetable. I will consider myself lucky. I have used kale in my cracker, but feel free to mix it up with your favorite winter greens. Spinach or chard would also toast up crisply and pair well with the creamy nuttiness of the Gruyere cheese. A dusting of sea salt and a little aromatic rosemary finishes the cracker. Serve it as an appetizer or with a salad or soup. Fran Hill's Cracker with Greens can be served as an appetizer or with a salad or soup. In a food processor fitted with regular blade, pulse flour and butter in short bursts until ingredients are combined and resemble crumbly sand. With the motor running, pour in the buttermilk and process until the dough starts to pull together into a ball. Turn dough out onto a floured surface and form into a disc. Wrap disc of dough in plastic wrap and chill for at least 30 minutes. Preheat oven to 400 degrees. Divide the dough into 2 portions. On a floured surface, roll each portion into a rough 13-inch by 11-inch shape. Transfer each to 2 baking sheets lined with parchment. Brush each with a mixture of beaten egg yolk and water. Sprinkle with rosemary. 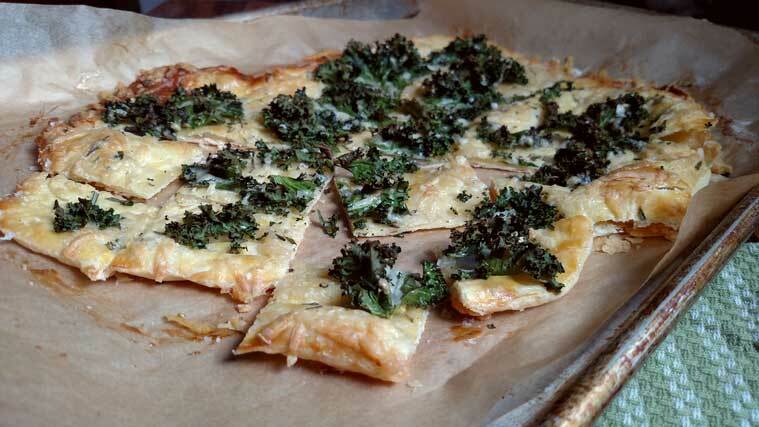 Arrange kale on top, pressing lightly into the crust. Sprinkle each with half of the cheese. Bake 15 minutes, or until golden and kale is toasted. Cool completely, then cut into cracker portions. Sprinkle with sea salt before serving.